The sun is shining, the snow is melting, and I finally feel like the motorcycle industry is listening to their lady riders! When it comes to gear, I always find myself gravitating toward the men’s selection because let’s face it, not all gear is created equal. However, as you can see in the new Alpinestars Spring Collection, and particularly in the Alpinestars Stella SMX-1R Boots and Alpinestars Stella SP Air Gloves… someone is paying attention! However, I am very happy to see that the new Alpinestars Stella SP Air Gloves come in an all black or black and white version… with no pink in sight! 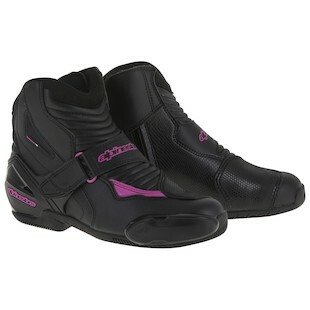 Don’t get me wrong, I love owning that I am a woman rider… but I do not need everything in pink! Give me brown, green, blue, red, black, yellow, orange… just please, no more pink. Anyway, I digress. 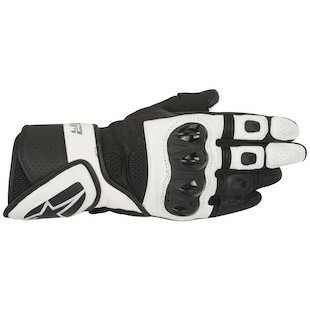 Other than the fact that these are optimized for a women’s fit, these gloves are an exact copy of the men’s version. However, with full-grain leather construction, these are not vegan (sorry!). If you are looking for a protective leather summer glove, Alpinestars has delivered with perforated leather and 3D mesh inserts for great airflow. I am happy to see that the Stella SP Air have a TPU knuckle, protected seams, palm slider and extra padding in the fingers, palm and hand. I can never understand how some women’s gloves will come with a pad in the palm but the men’s version has a TPU palm slider. Thank you Alpinestars for listening to us!!! The last thing I want to note is the new stretch insert between the thumb and palm. No more thumb workout trying to operate controls with a glove that doesn’t give! Again, Alpinestars is listening. All in all, I cannot wait for the new 2016 Spring Collection from Alpinestars. They really are paying attention to their women riders and actually giving us what we need. So, when that snow thaws and the sun makes your heart sing, you can rest easy knowing that Alpinestars has your back (and feet and hands). Ride safe ladies, I’ll see you on the road! Just not (entirely) in pink!